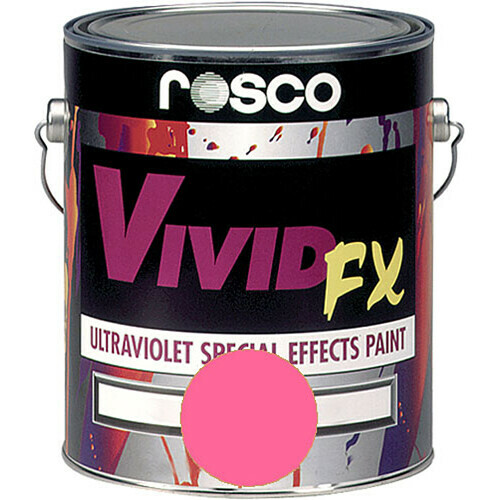 Rosco Vivid FX Paint - Hot Pink - 1 Qt. VividFX, an ultra-violet special effects paint represents a spectacular development for the special effects designer, scenic artists, and night club designer. This range of brilliant fluorescent paints is available in thirteen vibrant fluorescent colors. VividFX paints have been formulated using the highest quality fluorescent pigments available giving the artist an unparalleled combination of color choice, one coat coverage and hiding, fluorescence and versatility. VividFX paints are compatible with all other Rosco Scenic paints. Use VividFX paints mixed into standard scenic paint when matching the brightest Pantone colors. VividFX uses the same high quality, water base, vinyl acrylic binder found in Off Broadway paints. It is suitable for use over most surfaces and for interior and exterior applications. Rosco's new VividFX paints have been designed specifically to meet the demanding needs of the special effects artist. The brilliant pigments used create stunning blacklight effects and intermix cleanly to provide a wide array of intermediate fluorescent hues. Box Dimensions (LxWxH) 4.8 x 4.2 x 4.2"